The composer tells the 16+ hour long story using a ridiculously huge orchestra, which he uses to captivate listeners with magical colors and ingenious storytelling devices. Wagner's Ring Cycle is incredibly important in the history of music. This is for a number of reasons: its massive scope and length, its philosophical ideas, and because it has very powerful and beautiful music. Wagner's idea was to have a three evening event, with a "preliminary" evening as well (to warm the audience up...). Wagner's Ring Cycle grew and grew out of a single idea. Wagner originally wanted to write a single opera called "The Death of Siegfried". He got the inspiration for this from Norse mythology and an ancient German epic called the "Nibelunglied". He found that the story was getting too complex, however, and decided he need to add another opera in front to explain what was going on. But the same thing happened again, and he ended up adding two more operas in front of the first two (to explain the explanation!). The result was the text of the four-opera Ring Cycle. It took Wagner about 21 years after that to finish composing all the music for Der Ring des Nibelungen. To be fair though, he did take 12 years off while in the middle of writing Siegfried (the third opera)! Wagner envisioned a special opera house created especially to perform the Ring Cycle. He eventually designed and constructed the Bayreuth Festspielhaus, where the full Ring Cycle was premiered on August 13, 1876. King Ludwig of Bavaria, being the Wagner fan that he was, ordered the first two operas of the Ring Cycle (Das Rheingold and Die Walkure) to be performed before Wagner had finished the other two. Wagner really didn't want this to happen, but the King's word was final! So Wagner kept it a secret when he finished Siegfried (no.3). The three Rhinemaidens are playing in the Rhine. Alberich (a dwarf, the Nibelung of the title) lusts after them, but they reject him. Alberich is pretty angry, so he gives up on love altogether and steals the Rhinemaidens gold, planning to use it to create an all powerful ring and dominate the world. Alberich puts a curse on the ring which dooms whoever it touches. The giants fight over it, and Fafner kills Fasolt. The gods then enter their new golden castle across a rainbow bridge in a spectacular finale, while the Rhinemaidens below lament the stolen gold. I really like this last scene. Siegmund (Wotan's son) is running from pursuers, weaponless. He stumbles into a house where Sieglinde and Hunding (a hunter) live. Hunding realizes that Siegmund is the man he was after, and tells him they must fight in the morning. Sieglinde, desperate, gives Hunding a sleeping potion and urges Siegmund to escape. The pair realize they are twins (Sieglinde is Wotan's daughter). Siegmund pulls an ancient sword out of the tree in the house, and claims Sieglinde as his bride (huh?). Wotan asks the Valkyrie Brunnhilde to protect Siegmund in the fight. Wotan's wife Fricka (goddess of all things marriage) appears and tells him he has to protect Hunding instead, otherwise his power will go. Wotan gets really frustrated, and sullenly tells Brunnhilde she has to protect Hunding instead. Brunnhilde meets Siegmund and is impressed by his bravery. She decides to help him instead and disobey Wotan. Hunding and Siegmund fight, but Wotan appears and breaks Siegmund's sword. Hunding then slays Siegmund. Brunnhilde escapes with Sieglinde and the broken sword. Wotan then punishes Brunnhilde by putting her in a deep sleep surrounded by fire, to be the bride of whomever wakes her. At the beginning of the third opera in Wagner's Ring Cycle, Alberich's brother the dwarf Mime (pronounces Me-meh) has raised Siegfried (Siegmund and Sieglinde's son) for 20 years in a cave in a forest. A mysterious Wanderer (just Wotan in disguise) arrives and plays a game of riddles with Mime. He then tricks the dwarf into planning to Siegfried to kill Fafner the giant, who's transformed into a dragon and is guarding a mountain of treasure. Mime persuades Siegfried to fight the dragon, and plans to poison Siegfried after he's won. Before the fight, Siegfried befriends a little forest bird. He tries to talk to it by making his own flute, but it doesn't work. Siegfried encounters the dragon Fafner and kills him in a fun battle scene. When pulling out his sword from Fafner's body, he accidentally tastes the dragon's blood. This magically makes him able to talk to and understand the forest bird (I want some!). The bird warns him about Mime, and tells him about a beautiful woman high up on the rocks. Siegfried kills Mime and heads for the woman. He finds Brunnhilde, and wakes her with a kiss. The opera ends with their massive love duet. The last opera in Wagner's Ring Cycle begins exactly where the last one left off. The lovers, now more mature, sing about their love, then separate. Siegfried sails down the river Rhine in a scene with some amazing Wagnerian water music. He reaches the Gibichung's hall. There he meets Gunther, his sister Gutrune, and Hagen (Alberich's son). Hagen wants the ring, so he tricks Siegfried into drinking a love potion which makes him fall in love with Gutrune. Siegfried now returns to Brunnhilde, using the Tarnhelmet to disguise himself as Gunther. He forces Brunnhilde to return to the Gibichung's hall and marry Gunther, so that Siegfried can marry Gunther's sister Gutrune. During the wedding, Brunnhilde realises that she has been betrayed by Siegfried, and is bent on vengeance. She tells Gunther that Siegfried was already married to her. Then she tells Hagen that Siegfried has a weak point on his back (since he would never turn and run from an enemy). Hagen kills Gunther after they fight about who gets the ring. Brunnhilde realizes that she and Siegfried were both tricked. She sets fire to Siegfried's funeral pyre, mounts her horse, and leaps into the raging flames. The Rhine river overflows while Valhalla bursts into flames.Hagen jumps into the Rhine after the ring, but the Rhinemaidens drown him and get the ring back. Wagner's Ring Cycle has a reputation of being BIG! It's where the clichéd image of the fat opera singer with a horned helmet comes from. It's true that singers need superhuman amounts of power and stamina to perform the cycle, but that image isn't really true! Wagner's huge orchestra allows him to create a really wide range of orchestral colors, as well as make the music staggeringly heavy and rich. There are hundreds of different shades, moods, and feelings which Wagner creates in the Ring Cycle just using various combinations of instruments. Somehow he also evokes images of the action through the orchestra. For example, in the forging scene in Siegfried, the music seems to me to be fire, steam, metal, and hard toil. Wagner's Ring Cycle has a massive system of leitmotifs (little melodic fragments which represent a person, place, idea, etc.). These all interconnect, blend, and transform to tell the story through music as well as drama. Sometimes the music even lets the audience know things the characters don't (like when Siegmund is talking about his unknown father, the orchestra plays the Wotan motif). Siegfried the Hero: this noble theme represents Siegfried as a mighty hero. Siegfried's Horn Call: this is the energetic and adventurous fanfare which Siegfried plays on his horn. The Sword: this motif represents Siegfried's sword. The Curse: a powerful and scary theme which represents the fatal curse which Alberich put on the ring. Valhalla: a beautiful and solemn melody which depicts the glorious castle of the gods. Valkyrie: this warlike melody represents the Valkyries, who take dead heroes back to Valhalla for Wotan. Magic Fire Music: this theme represents Loge (the demi-god of fire) at first, but later on in the cycle Wagner uses it to represent the magic fire that surrounds Brunnhilde. Dragon: an evil-sounding theme, played in the bass, which depicts the massive and frightening dragon Fafner. Wotan: this strong motif depicts Wotan's spear and his power. There are so many of these combinations and blendings that probably Wagner didn't know of them all (ok, maybe he did...). But I hope this shows you how fundamentally important the music of Wagner's Ring Cycle is to the story. 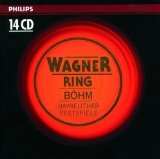 One of my favorite recordings of Wagner's Ring Cycle is the 1966 Bayreuth recording conducted by Karl Bohm (the clips above are from this recording). I just love how well the singers fit their different roles, especially Wolfgang Windgassen as a youthful and energetic Siegfried (he could have had a little bit more power in his voice though), and Theo Adam as a noble and wise Wotan. Recommended. Click to listen to and explore Wagner's other great operas!